After last week’s debacle, I was a bit worried about today’s long run – one of two I need to complete before the Berlin Marathon at the end of September. But I need not have worried. It was hard work, but actually quite fun. 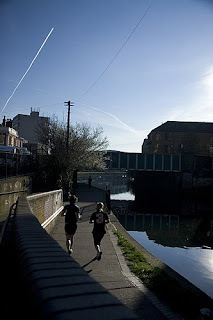 I ran the same route as a couple of weeks ago, leaving Wanstead, running through Lea Valley Park past Hackney Marshes, then following the Regent’s Canal past Victoria Park to Islington, down Pentonville Road, along Euston Road and heading towards Hyde Park. Instead of finishing in the park, I turned right along Brompton Road, down Kensington Church Street, pausing briefly to see what Dad’s old shop at number 40 looks like. (It is still an antique shop, but no longer painted in purple gloss paint.) Then I ran up Kensington High Street, past the Albert Hall, turned down Sloane Street, skirted Buckingham Palace gardens, up Victoria Street to Westminster. As I turned up Horseguards Parade I could hear that Trafalgar Square was busy with crowds celebrating the end of the Beijing Olympics and the handover to London. Finally, I headed along the Strand and Fleet Street to end at St Paul’s Cathedral. 20 miles in 3hrs 40 mins. The secret to today’s successful run: A relaxed slow run, stopping at newsagents to refuel with Gatorade and Mars Bars. Smiling at tourists, even in Kinightsbridge Putting one leg in front of the other.